The Smith and Wesson model 29 has been a fixture in my mind for well over 30 years. Ever since I saw the steely resolve on his face and heard Dirty Harry (hereafter known as DH) utter the words “make my day” the model 29 has been a desire of mine. But back over 3 decades ago, the Smith and Wesson model 29 became so popular because of DH that they were virtually unattainable for regular people like me. Even if I had been able to find one, they were so prohibitively expensive that I wouldn’t have been able to buy one. So, in those days I had a Ruger Blackhawk .44 magnum, a Dan Wesson .357 magnum and a few other guns. But the S&W model 29 remained elusive. As time went on, and I drifted away from shooting for quite a few years, I put the Smith and Wesson model 29 in the back recesses of my mind. But whenever I saw a DH rerun or heard the famous words “make my day” the flashback of the model 29 would appear in the frontal lobe of my brain. I would find myself pointing the big, good looking gun making it with my hand and finger. 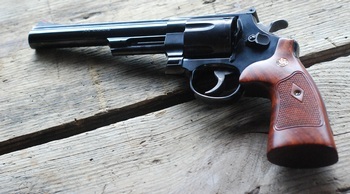 Smith and Wesson came out with lots of model 29s after the original, all numbered, model 29-1, 29-2, 29-3, 629 (stainless), most models bearing manufacturing changes designed to "improve" the revolver. Some did that, some were nearly disastrous. 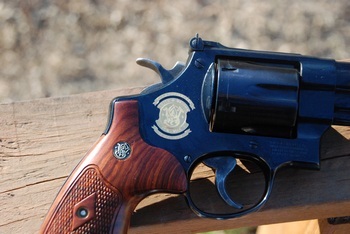 Finally S&W discontinued, in the late 1990s, the basic model 29 (the “real one” that Harry used to dispense with the most deplorable of murderous criminals). It looked like an era had ended. Then in 2006, with a stroke of genius by Smith and Wesson, they created the Smith and Wesson Model 29 Anniversary Edition .44 magnum and the Dirty Harry gun was reborn. And my second chance to own one came around. Not many were available here and I couldn’t find one for some time. But then it happened. On Tuesday, January 13, 2009, I walked into Coopers Gun Shop in Fort Smith and there it was. MY Smith and Wesson model 29. Not the original, but a technologically improved model that looks just like the original, which, in my opinion was the best looking revolver ever made. I went home, took a couple of agonizing days deciding what I would trade in on it and take a financial hit on. Then on Thursday, January 15, 2009 I walked back into Coopers with a couple of guns to trade and the model 29 became mine…..finally. The Smith and Wesson model 29 is nothing short of beautiful. Blue steel, “unfinished” appearance on the trigger and hammer, walnut grips. And the lines of the revolver are classic. Smooth but impressive. Now, when you build up high expectations for anything like I did for the Smith and Wesson model 29, the actual ownership and use can really be disappointing if things don’t go well. But that wasn’t the case with this sleek, powerful and accurate .44 magnum. Shooting it just made the acquisition of it that much sweeter. The other two .44 magnum revolvers I’ve owned over the last few years (Ruger Redhawk and Ruger Alaskan) were not very enjoyable to shoot. I never could get my hand solidly on the odd Ruger Redhawk grip that allowed me to sustain any accuracy. Others could shoot it pretty well. I never could. The Ruger Alaskan was fun, but belongs in a world all it’s own with it’s 2.5 inch barrel. The model 29 fit my hand like it was designed for it. My first few shots were low. 3 clicks left on the rear adjustable sights were all it took. Paper targets full of holes. Bowling pins going down and being bounced all over the range. Jugs full of ice doomed to splattering 20 feet in all directions. The gun almost points and shoots itself. My first shooting with it was at the Brushy Hollow firing range in Waldron, Arkansas with the Right on Target Group. 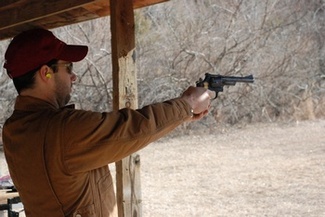 The picture below is of my good friend, Jarvis firing the Smith and Wesson model 29. Everyone that shot it just said “whew” and marveled that it was so nice to shoot and accurate even in inexperienced hands. 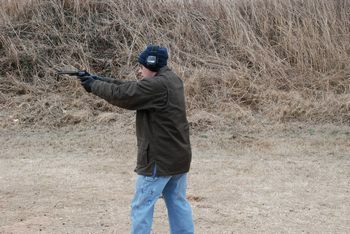 My next test with the gun was at the Old Fort Gun club on a nasty cold windy day. I know I’m not very photogenic in that ridiculous looking stuff but shoot! It was cold. The gun was shot in both sessions with reloads. 240 Grain Hornady XTP JHPs in front of 9.5 grains of Hodgdon Titegroup, and a second load: 200 grain Nosler Jacketed soft tip 200 grain bullet – same powder charge. These loads are designed to send the bullet downrange from 1200-1300 feet per second. And they were sweet out of this gun. It’s probably best not to get one of these if you are a testosterone controlled reloader. That's especially important if you're one who likes to put all the powder you can put in a case, then jam the bullet in with a punch and ball peen hammer to see how much you can make it hurt. Use the gun with standard loads and it will serve and last a long time. Save the max loads for the beefier, if less refined Rugers. The revolver sights are great with the fully adjustable rear sight and the red ramped front sight. They worked perfectly as far as accuracy and are very visible in reasonable light. The gun functioned perfectly in all respects. Loading, firing, accuracy, ejection, single action, and double action. .44 magnum, Capacity: 6 rounds, Barrel Length: 6.5 inches, Front Sight: Red Ramp, Rear Sight: Adjustable, Grips: Walnut, Frame: Large, Finish: Blue, Overall Length: 12 inches, Frame and Cylinder material: Carbon Steel, Weight Empty: 48.5 oz. 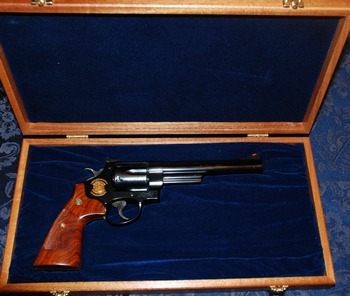 The gun comes in a nice wood display case that is blue velvet lined. BOTTOM LINE: Probably is pretty obvious. This is a gun that lived up, even to my inflated expectations. I acquired my model 29 by trading in 2 nice, fairly new revolvers and some hard earned cash for it. I don’t regret it and am happy with both the trade and the value of the gun. If you have an opportunity to get a Classic Smith and Wesson Model 29, go for it. Oh and just one more thing. People have asked me if I’m going to change out the Walnut grips for Hogue Grips which is pretty standard with large caliber revolvers. My answer: Dirty Harry didn’t have to change his grips…..so neither do I. NOTE: Smith and Wesson now has on their web site a line of "classic" revolvers that are in production, including the model 29. Thank goodness it's back. 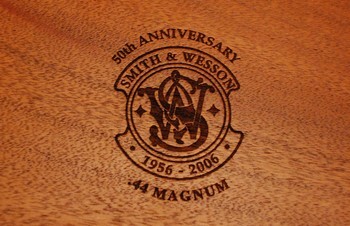 UPDATE: As of July 2012 this has continued to prove that S&W turned out a serious shooter in their anniversary Model 29. 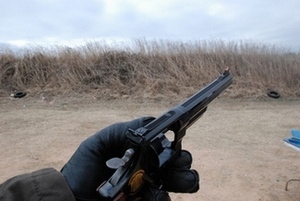 The accuracy of the gun startles the most experienced of shooters. Revolver Grips of all sizes. Click on the type for a variety of choices and sizes.